1. (in ancient Greece and Rome) a room or covered area open on one side, used as a meeting place. 2.	a permanent outdoor bench, semicircular in plan and having a high back. 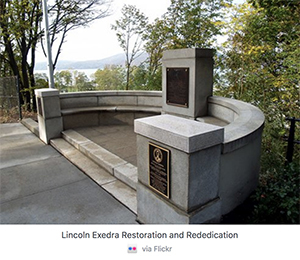 The Lincoln Exedra was created to commemorate the Lincoln stop of 1861. It is located on South Street in Peekskill and provides a direct line for viewing the original train depot (now the Lincoln Depot Museum http://lincolndepotmuseum.org/) below to the West. The land was donated by John Smith Jr., a veteran of the Civil War and a President of the Lincoln Society from 1917-1918. 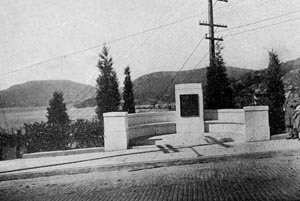 It was designed by Peekskill architect Gilbert H. Anderson and his artist brother Victor C. Anderson. Antonio S. Renza built the structure with granite furnished by the Grenci & Ellis quarry. 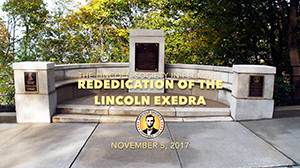 The center of the exedra contains a bronze portrait tablet of Lincoln that was created at the Tiffany Studios in New York City. 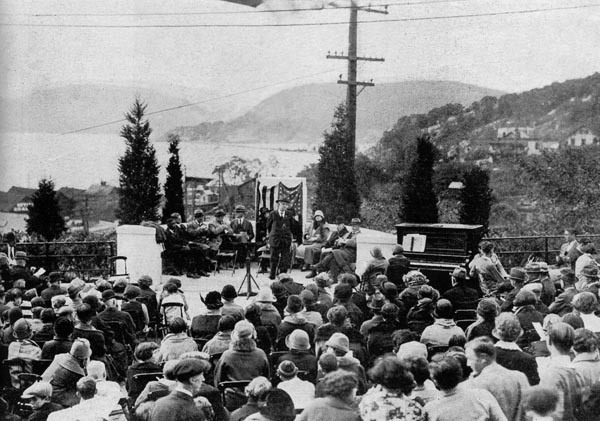 The photo above shows the October 6, 1925 dedication of the Lincoln Exedra. 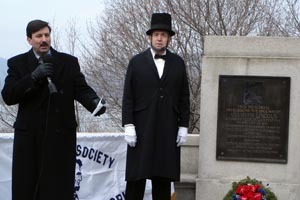 Addressing the audience is Henry S. Free, Peekskill sole surviving member of the Grand Army of the Republic and was also present when Lincoln stopped in Peekskill. Also present were NYS Assemblyman James K. Apgar, Thomas Nelson (grandson of William Nelson), Dr. Alexander Dunbar who was Superintendent of Schools and classmate of Robert Lincoln at Harvard, NYS Senator Seabury C. Mastick, Peekskill Highland Democrat Editor George Briggs who read a letter from his long-time friend Chauncey M. Depew (who knew President Lincoln intimately) as well as many other dignitaries. Photo and information above was obtained from the book “Peekskill, A Friendly Town: Its Historic Sites and Shrines: A Pictorial History of the City from 1654 to 1952” by Chester A. Smith, The Friendly Town Association, Peekskill, NY, 1952. Photo of Exedra from Chester Smith's book. Mayor and Lincoln Society President John Testa at the Lincoln Exedra with Lincoln reenactor Michael Griest during the Lincoln Society's annual ceremony.